Thank you to the volunteer who took these new photos and allowed me to share them with you! For a little over two years, it’s been a major construction site. First came site preparation. Then came the tall cranes. A huge steel framework climbed 15 stories into the sky, gaining concrete floors as it rose. The structure grew a “skin” of exterior walls, glass, and lanais (balconies). 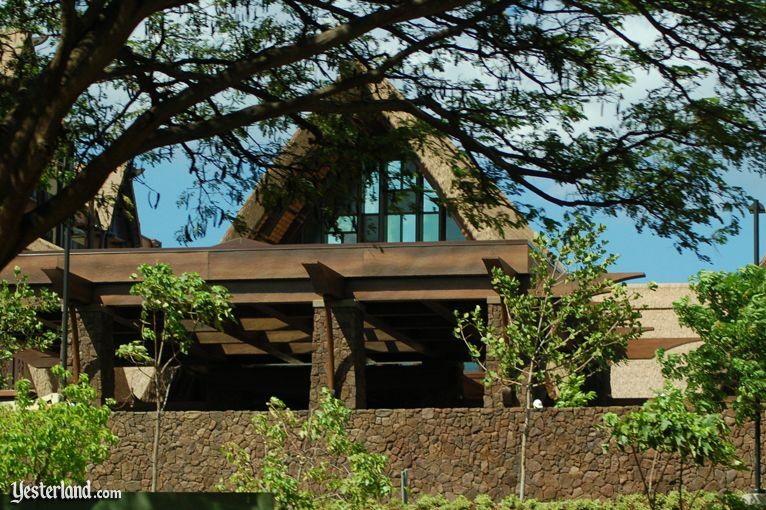 An odd steel skeleton became Pu‘u Kilo, the resort’s dramatic volcanic lava outcropping. 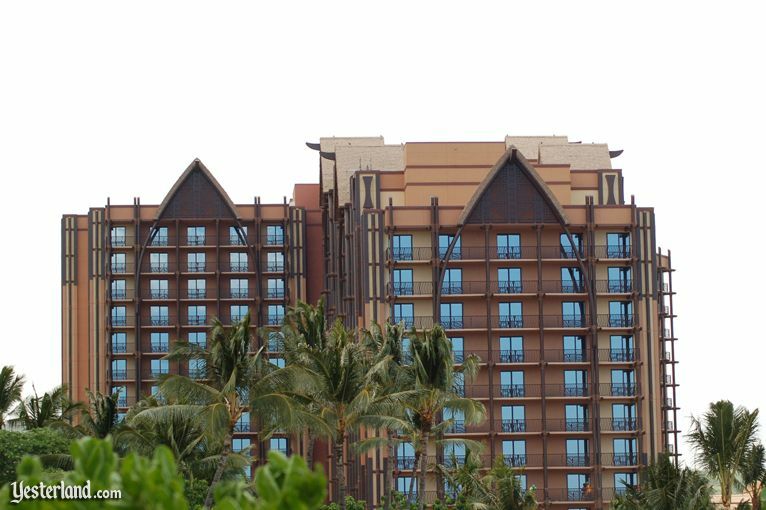 Now, Aulani finally looks like a resort hotel—except for the tall green construction wall that still surrounds the property. Not only is the exterior work essentially complete, but palm trees, much taller than the construction wall, now soar into the air. Other mature trees planted earlier this year are taking root. 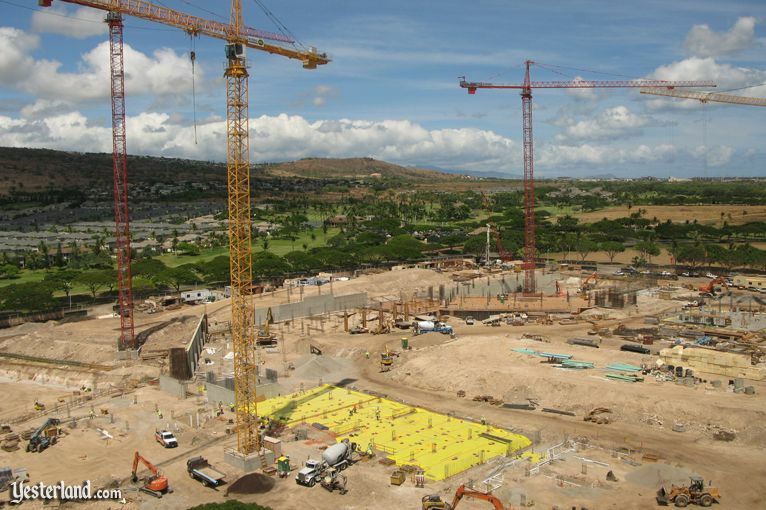 Landscapers are busy turning the bare earth of the construction site into a lush Hawaiian paradise. The new trees and bushes at the porte-cochère are examples of the landscaping activity now transforming the property. The artist’s rendering (above) of the same porte-cochère suggests that even more greenery is on the way—even on the canopy over driveway. From some angles, the towers look complete. The exterior surfaces have all been painted. 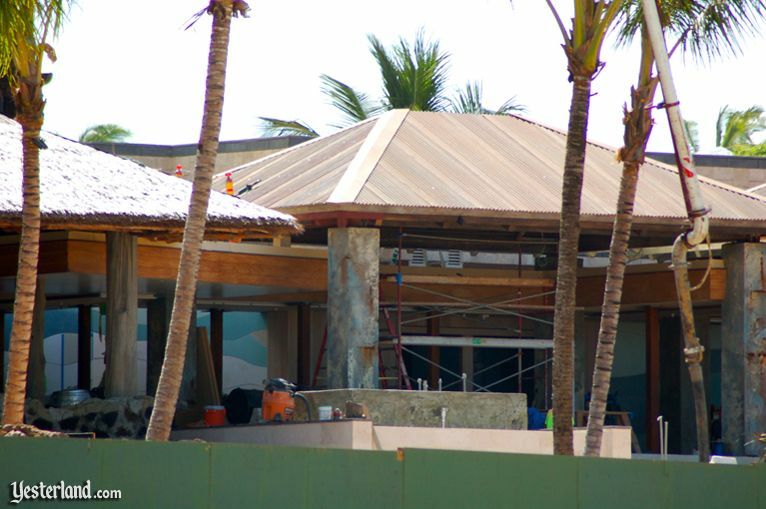 The lanai railings are in place. All that’s missing from the lanais are the comfortable chairs from which guests will watch the impressive Ko Olina sunset. But from other angles, you can see exterior construction elevators, confirming that this is still construction site. There is undoubtedly far more work going on inside than on the exterior. 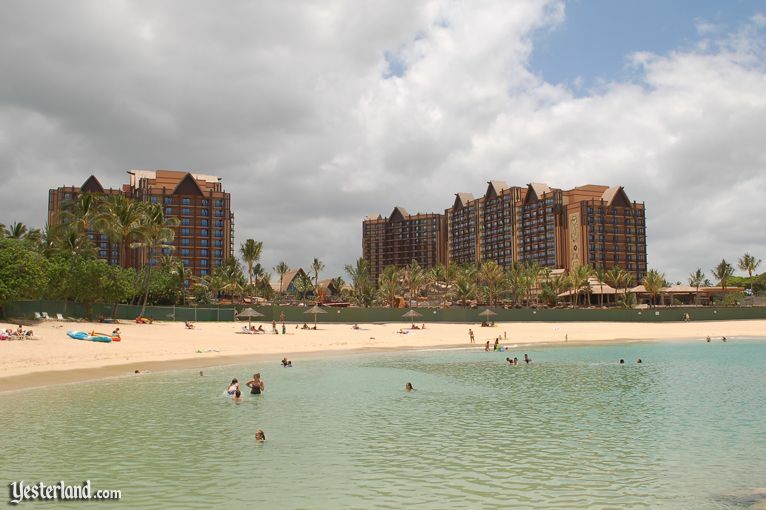 When the resort opens, it will have 209 hotel rooms and 119 two-bedroom equivalent Disney Vacation Club (DVC) villas. And there will be the various public areas such as the lobby and restaurants. That’s a lot of work. 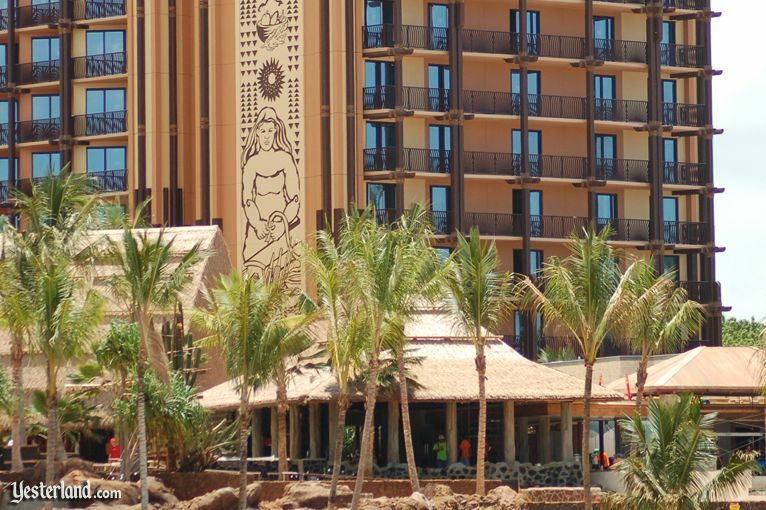 Even so, much of Aulani will be an empty shell on opening day. 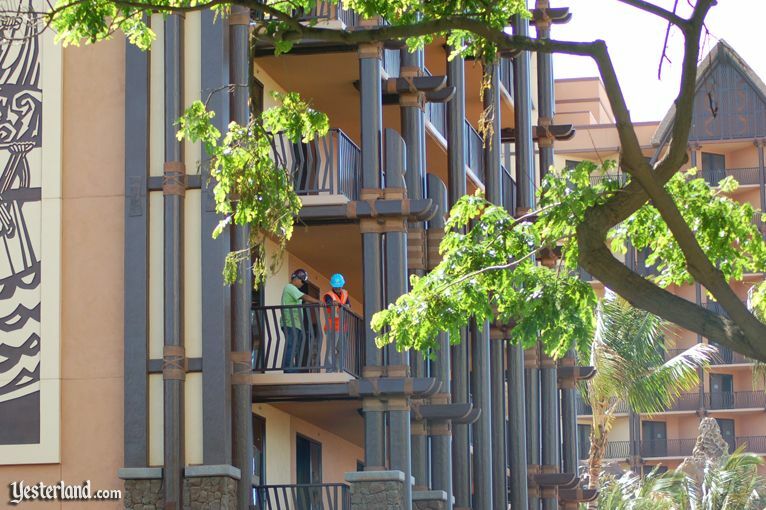 More than half the hotel rooms, but only a quarter of the DVC villas, will be open. 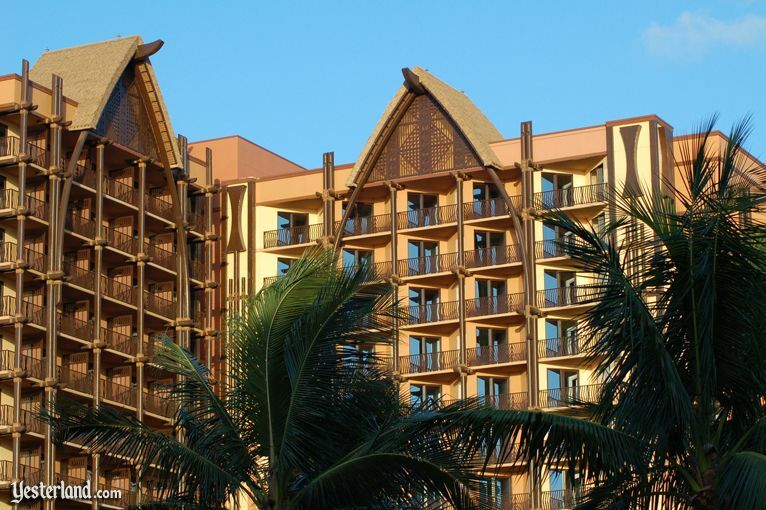 The full build-out is scheduled for winter 2013 as phase 3, bringing the totals to 360 hotel rooms and 481 DVC villas. Outside, Disney’s famous attention to detail is becoming evident. The bottom half of the photo above shows a rustic bridge—but what is the structure in the top half? 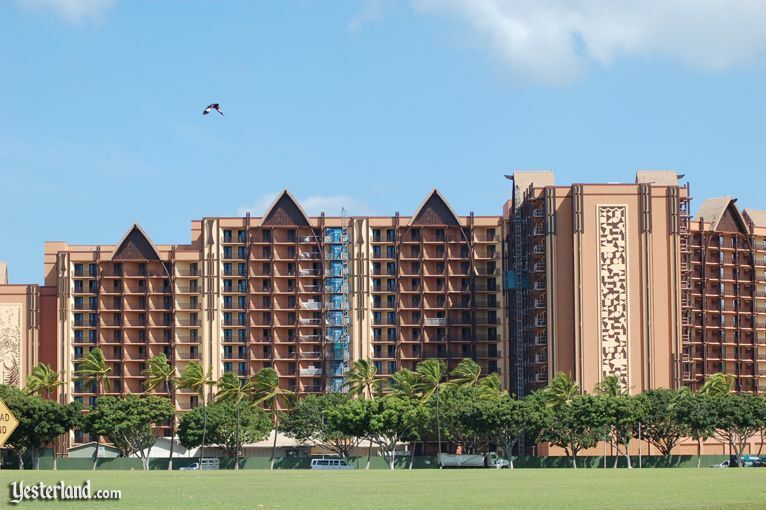 Disney has so far hired about 100 employees, many in managerial positions, said Djuan Rivers, vice president of Disney Vacation Club and Resort, Hawai‘i. The company is now moving forward with hiring many of the hourly workers to fill a variety of positions from housekeeping to food and beverage and entertainment in preparation for the Aug. 29 opening, he said. Response from job seekers has been overwhelming, with 2,000 to 3,000 applications being submitted, according to Rivers. 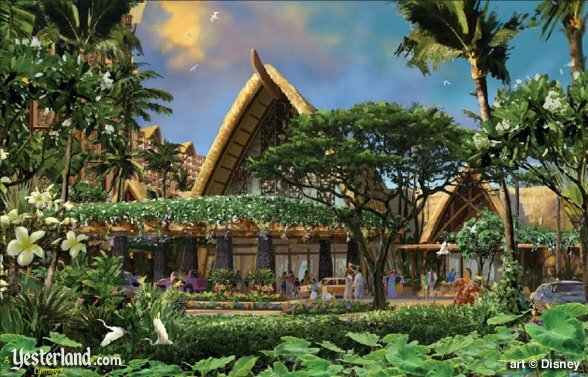 Eventually, when phase 3 opens, there will be 1,250 Cast Members at Aulani. 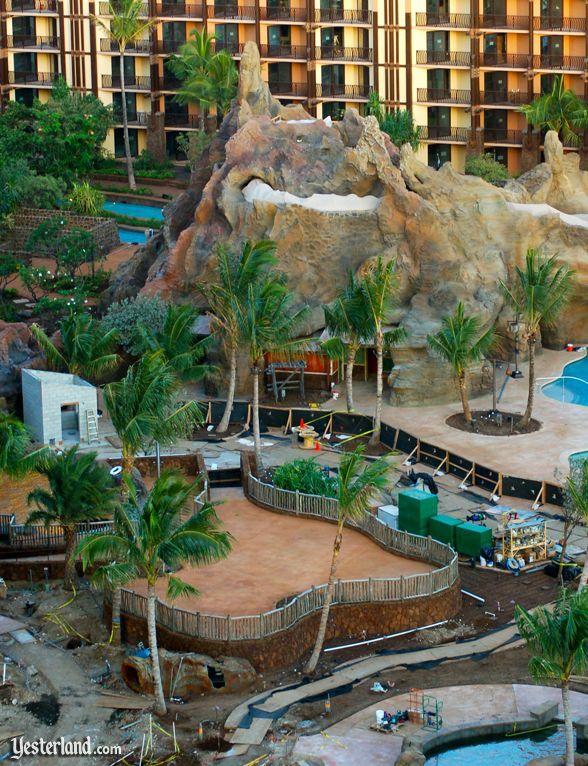 Pu‘u Kilo is a Disney-built volcanic lava outcropping that will serve as the starting point for two of the resort’s water features. 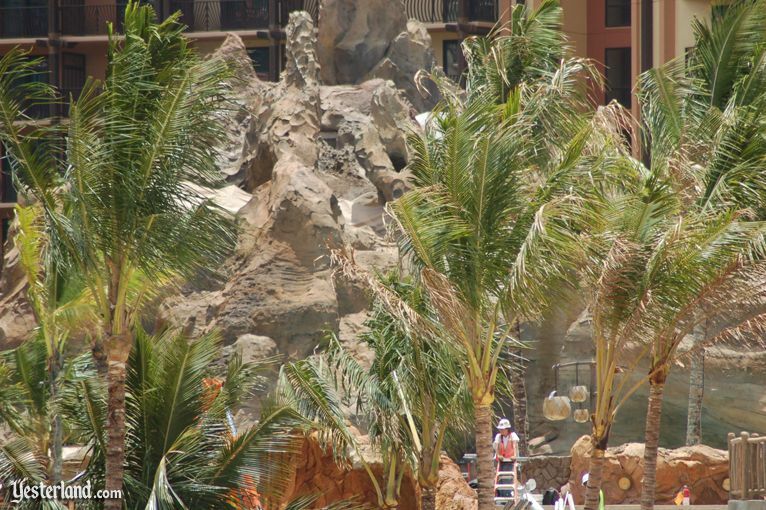 For more about Pu‘u Kilo, see Expedition Aulani, the previous article in this series. The photo above and the next two photos show how this new Disney mountain looks in late May 2011. 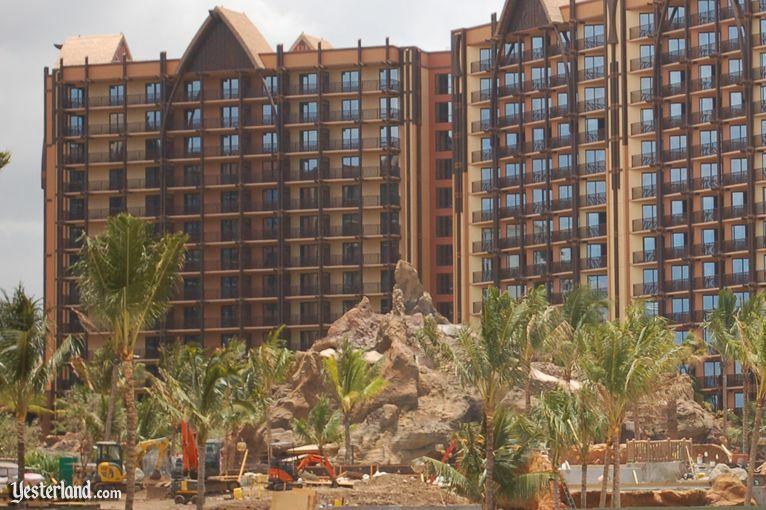 Aulani is not quite done yet—but the site certainly has changed since 2009! 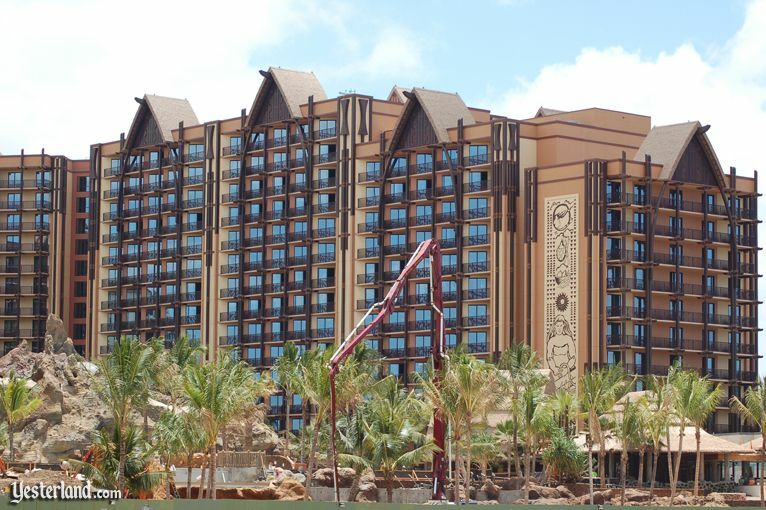 For more about Aulani, including details about its restaurants, amenities, and room rates, visit the official Disney website for Aulani, a Disney Resort & Spa in Ko Olina, Hawai‘i. 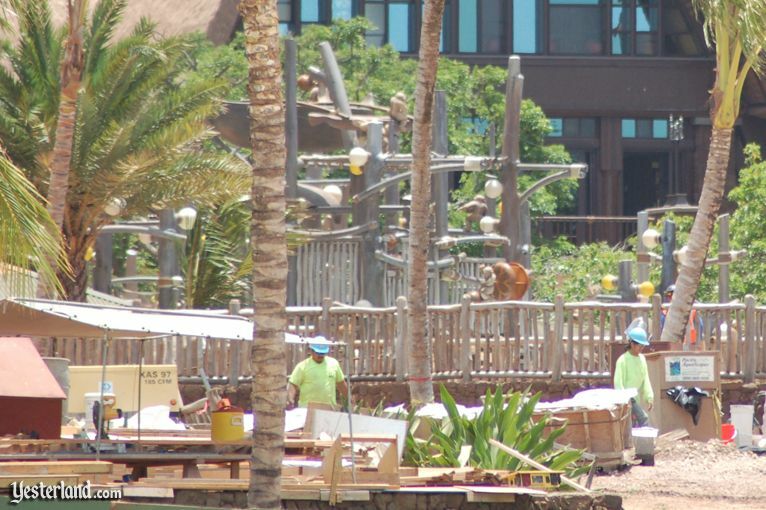 Photographs of Aulani construction: May 2011 by anonymous. Evening shots taken Monday, May 23, 2011, at approximately 6:45 p.m. HST. Daytime shots taken Wednesday, May 25, between 10 a.m. and noon HST. Porte cochere rendering © Disney. 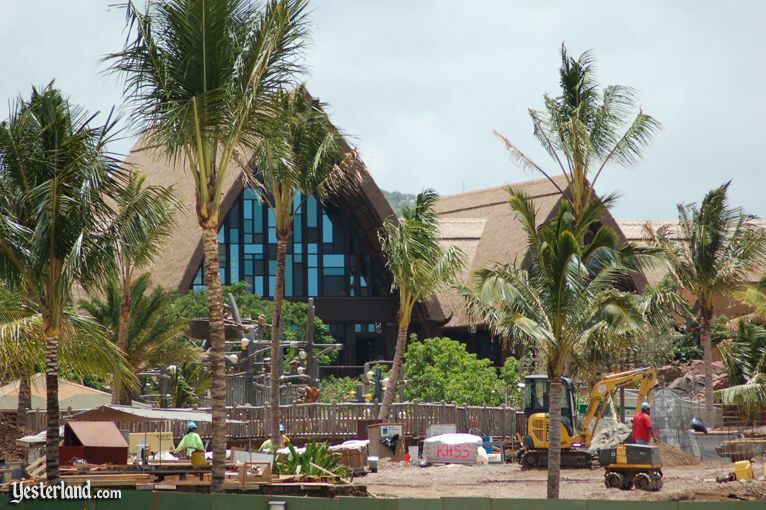 Photo of early construction at Aulani site: July 2009 by Werner Weiss.